This trip allows you to be the privileged witness of the oldest and most colorful festival celebrated in Ethiopia Timket Festival . It commemorates the baptism of Christ for three days of religious fervor culminating takes place on January 19. These exceptional festivities are punctuated by prayers, songs, dances, are ready dressed in their embroidered and colorful umbrellas and capes . Processions Tabot – replica of the Ark of the Covenant ” complete these commemorations. You will attend Gena – Orthodox Christmas – with ” Eve ” in the wake of the rock churches of Lalibela and Timket ceremony in Addis Ababa. 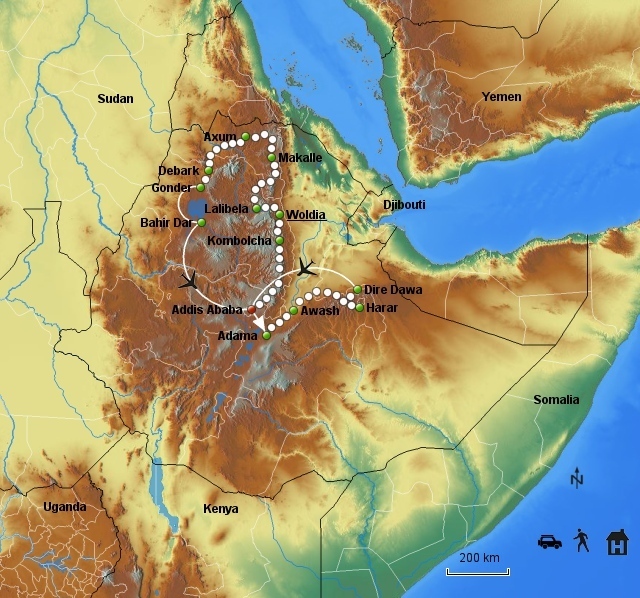 During this voyage of discovery, you will visit the incomparable sites of the historic route of Ethiopia including four sites are listed in the World Heritage List of UNESCO , including: Axum, Lalibela , Gondar , the island monasteries lake Tana , the palace of the Queen of Sheba . With an extension to Harar east of Ethiopia , the city was ruled by 72 successive Imams since its inception from 1500 until 1900 through a strong and authentic Muslim tradition at découlée . You’ll love getting lost in its narrow streets and discover its houses hararie style unique home decor and colorful facades or Arthur Rimbaud lived.